A sensation at the World Cup after hosts Russia knocked out tournament favorite Spain after penalties. The Spanish team of Iniesta and Isco already looked like they were in trouble during the regular time of the match, when just before the half Russia was granted a penalty after a hands ball by Spanish defender Gerard Piqué. Russian striker Dzyuba hit the target and put them level at 1-1. Before that, Spain had simply dominated for 40 minutes and left the Russians running after the ball. Everyone expected a similar scoreline as when Uruguay faced the hosts in their group match (the South Americans beat the Russians 3-0) when Spain scored via a header after only 10 minutes but Spain failed to score a second in the first half, after which the Russians, who never seemed to be in control of the game, equalized after a penalty. In the second half though, Spain continued its pace of passing the ball around and letting the Russians run after it. With about 5 minutes of normal play left, Spain had 75% possession and some 800 passes, but still, they were unable to score a second time against the Russians who refused to yield. Although a Spanish victory never looked in doubt to most commentators, for the first time in this tournament, the game went into overtime. In the first half of overtime, both teams refused once again to score whilst Spain still had the better part of the game. In the second half, players were already more busily thinking about the upcoming penalties than anything else and played with a hand-break on. By the end, the Spanish were starting to stress though as penalties needed to decide the eventual winner. Each of them got five. 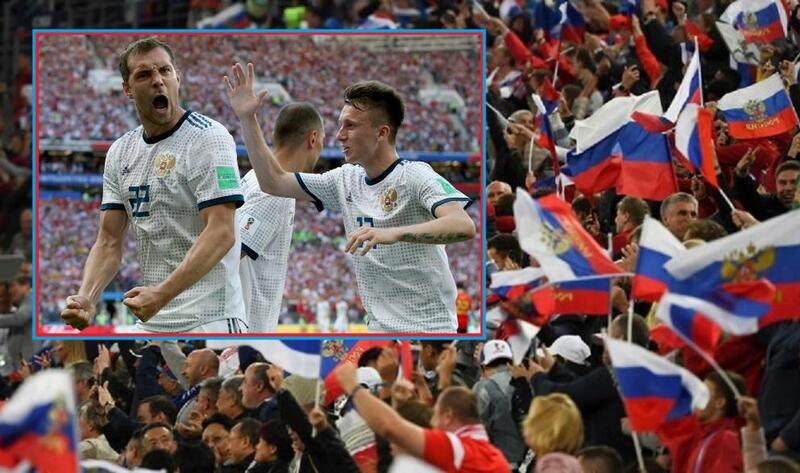 Unluckily for Spain, two of their strikers missed and Russia went into a crazy night as their team progressed into the quarterfinals. In the other game yesterday evening, the South Americans of Uruguay sent European Champions Portugal and their star striker Ronaldo home after two superb Edison Cavani goals. Croatia, one of the best playing teams in the group stages (they superbly sent Argentina packing with 0-3) go up against the Scandinavians of Denmark and although Tottenham star Christian Eriksen was able to lead his Danish teammates through a group which also contained France and Australia, most analysts expect the Croatians to put them aside and be the team that Spain will face in the next round.